Fig. 1-7. Middle Carboniferous, Lower Bashkirian: radiolarian beds with Caspiaza spp. – Bientactinosphaera aenigma. North Dipression Side Zone, Karachaganak Massif: fig. 1, 3, 4 - borehole12, sample 633 (depth 4656-4663 m); fig. 2, 5-7 - borehole13, sample 3096 (depth 5109-5116.5 m). Fig. 1. Entactiniidae gen. et sp. indet., FF-P229/220-00105 (bar=100µm). Fig. 2. Bientactinosphaera aenigma (Nazarov), FF-P229/221-00326 (=46µm). Fig. 3, 4. Spongentactinia fungosa Nazarov: 3 - FF-P229/228-00108 (=100µm); 4 - FF-P229/228-00120 (=46µm). Fig. 5. Caspiaza calva Afanasieva, FF-P229/205-00403 (=100µm). Fig. 6. Caspiaza urceus Afanasieva, FF-P229/204-00218 (=100µm). Fig. 7. Caspiaza aculeata Afanasieva, FF-P229/203-00402 (=100µm). Fig. 8-11. Lower Carboniferous, Upper Serpukhovian: radiolarian beds with Caspiaza spp. North Dipression Side Zone, Karachaganak Massif, borehole20, sample 42 (depth 4748-4753 m). Fig. 8. Caspiaza calva Afanasieva, FF-P229/205-00207 (=100µm). Fig. 9. Caspiaza urceus Afanasieva, FF-P229/204-00204 (=100µm). Fig. 10, 11. Caspiaza aculeata Afanasieva: 10 - FF-P229/203-00320 (=115µm); 11 - FF-P229/203-02609 (=50µm). Fig. 12-19. Lower Carboniferous, Lower Serpukhovian: radiolarian beds with Caspiaza spp. – Astroentactinia paronae. North Dipression Side Zone, Karachaganak Massif: fig. 12-15, 19 - borehole11, sample 360 (depth 4623-4638 m); fig. 16, 17 - borehole19, sample 112 (depth 4760-4769 m); fig. 18 - borehole19, sample 113 (depth 4769-4778 m). Fig. 12. Astroentactinia mendosa Nazarov, FF-P229/223-00215 (=100µm). Fig. 13. Astroentactinia paronae (Hinde), FF-P229/047-00205 (=40µm). Fig. 14, 15. Spongentactinia sp. (=100µm): 14 - FF-P229/222-00208; 15 - FF-P229/222-00221. Fig. 16. Caspiaza calva Afanasieva, FF-P229/205-00122 (=100µm). Fig. 17. Caspiaza aculeata Afanasieva, FF-P229/203-00401 (=100µm). Fig. 18. Caspiaza urceus Afanasieva, FF-P229/204-00217 (=100µm). Fig. 19. Spongentactinia fungosa Nazarov, FF-P229/228-00211 (=46µm). Fig. 20-23. Lower Carboniferous, Upper Visean: radiolarian beds with Caspiaza spp. – Tormentum ruestae. North Dipression Side Zone, Karachaganak Massif: fig. 20, 23 - borehole6, sample 8696 (depth 5059-5064 m); fig. 21 - borehole29, sample 851827 (depth 5128-5135 m); fig. 22 - borehole23, sample 45 (depth 4979-4985 m). Fig. 20. Tormentum ruestae (Ormiston et Lane), FF-P229/216-00332 (bar=136µm). Fig. 21. Caspiaza sp., FF-P229/225-00110 (=40µm). Fig. 22. Spongentactinia fungosa Nazarov, FF-P229/228-00121 (=100µm). Fig. 23. Spongentactinia sp., FF-L009/222-00509, thin-section (=100µm). Fig. 24-28. 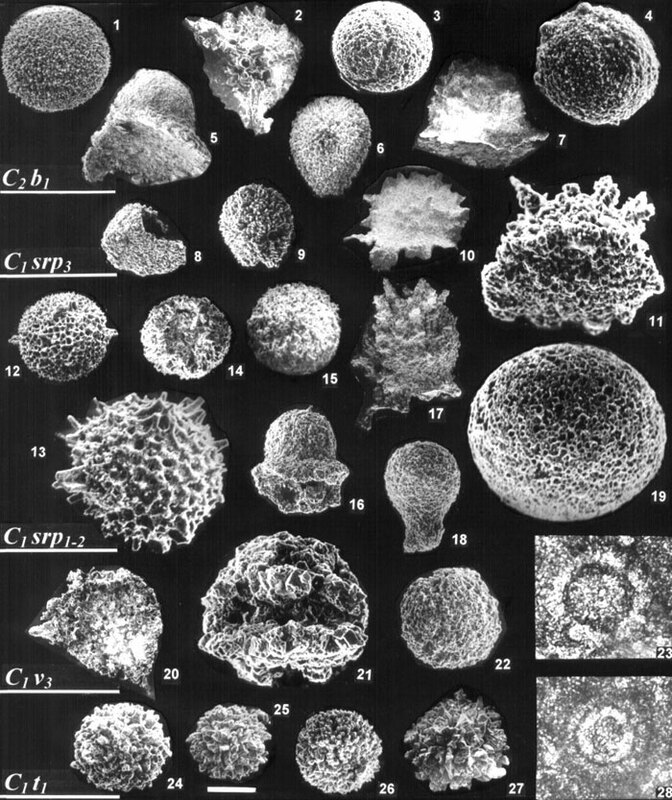 Lower Carboniferous, Lower Tournasian: radiolarian beds with Entactiniidae gen. et sp. indet. North Dipression Side Zone, Karachaganak Massif, borehole21, sample 8544 (depth 5097-5103 m). Fig. 24-28. Entactiniidae gen. et sp. indet. (=100µm): 24 - FF-P229/220-00126; 25 - FF-P229/220-00206; 26 - FF-P229/220-00210; 27 - FF-P229/220-00219; 28 - FF-L009/220-00601, thin-section.